With its selection of heels, Saint Laurent provides a collection of ultra chic and utterly covetable footwear that's sure to make the wish list of the fashion crowd this season. Whether you choose from sky-high stilettos or chunky heels, effortless style is guaranteed with every pair. Mary Janes with small, block heels are the high fashion answer to footwear this season, coming in bright pops of coloured glitter or with studded contrast heels for a playful edge. 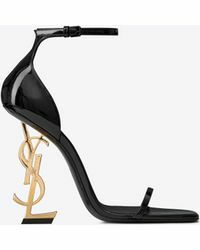 Heeled pumps and strappy sandals exude high-octane sophistication, femininity and glamour. 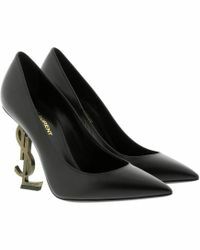 These are the shoes to be seen in this season.